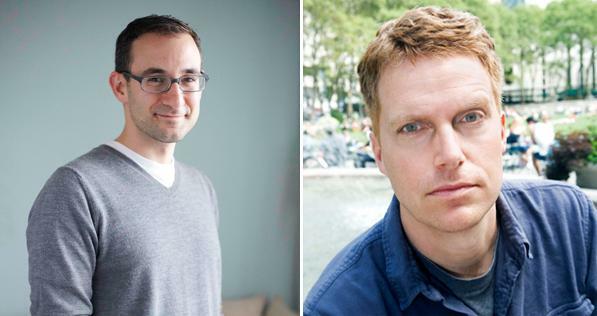 Shovel Ready author Adam Sternbergh interviewed by Crown editor Zack Wagman. The Slate Book Review author-editor conversation. Editor Zack Wagman, left, and author Adam Sternbergh. Crown editor Zack Wagman acquired New York Times Magazine editor Adam Sternbergh’s first novel, Shovel Ready, a “futuristic-dystopian-virtual-reality-hit-man-noir,” two years after the two first met. In this author-editor conversation, Wagman and Sternbergh talk about the pleasures of pulp, the challenges of editing an editor, and avoiding the phony voice of failed novels past. Adam Sternbergh: I imagine that for most editors, their relationship with a novel starts after it’s already been written—for example, when the manuscript first crosses their desk. You, however, played an integral role in inspiring this book even before I knew I was going to be writing a book at all. Do you recall that? Zack Wagman: Absolutely. It happened almost four years ago. I had pitched a book idea to your former New York magazine colleague Jennifer Senior. She politely—wisely—declined the idea, but we had a very fun lunch. Then, shortly after that, I get an email from you saying that Jen thinks we would like each other. What I remember most about that first meeting was that you were genuinely searching for a book idea, which is not always the case with magazine writers. You seemed to be getting a lot of advice to churn out a quick pop-culture nonfiction project … and yet all we were talking about were thrillers, sci-fi movies, and addictive television. You were clearly more interested in fiction, but you were hesitating. What was going on? Sternbergh: I was probably doing what I was habitually and temperamentally inclined to do in the presence of book editors, which was mumble some half-baked ideas for nonfiction books that I thought might be commercially appealing, but which, upon further reflection, I’d realize I didn’t even want to read, let alone write. You recognized this, and forcefully reiterated the question: No, Adam—what do you want to write? At which point I think I mumbled, even more sheepishly, something like: “Well, I’d like to write fiction.” The fact that you didn’t at that point fold your napkin neatly, rise from the table, and leave the restaurant was very encouraging. Wagman: I’ll admit to being totally unsure of what kind of novel you’d write, or if you’d write one at all. I had a nagging worry that you’d call me up one day and say, “I did it! I wrote a screenplay!” Which of course would have been great … for you. Sternbergh: Well, in the two years or so between that lunch and me sending you Shovel Ready, I fiddled around with a lot of different stuff. I even wrote a screenplay! No lie! It was mostly a personal exercise—though a lot of the thinking I did for it, about story and plot and pacing, etc., did make its way into Shovel Ready. You should be thankful I never sent you the screenplay. But I did ask my agent specifically to send you my book. Wagman: I’m curious how the writing process went for you. My experience is that first-time novelists often start off strong, and then peter out, unsure of how to wrap everything up. But you were the opposite. You seemed to get more confident as the book progressed so that, suddenly you had this layered and surprising character in a twisty and swift thriller plot. Sternbergh: I figure there’s roughly two ways to write a novel (of course, that’s not true, there are a million ways, what do I know, but bear with me): the plot-it-all-out-on-index-cards-ahead-of-time way and the E.L. Doctorow, headlights-on-a-foggy-night way. Which means basically: You can’t see the whole journey, but you can see just enough road ahead to keep moving. I definitely embarked on that second one. Which is not to say I had no idea where it was going or what was going to happen, but in the first draft I was definitely discovering this world—and this character—as it went along. Wagman: Where did Spademan’s voice come from? Sternbergh: In hindsight I can see a bunch of influences, some obvious, some otherwise, from classic clipped, hardboiled prose to some poets I really admire to my complete obsession with Twitter as a communicative medium. (It is perhaps the greatest linguistic corset devised since the sonnet.) But, honestly, I started out by deciding what I didn’t want the voice to be: I wanted to completely avoid a kind of self-consciously “writerly” and often phony voice I’ve recognized in my own failed fiction writing in the past, and seen too often elsewhere. Wagman: Was it weird for you as an editor to be edited? Sternbergh: Not at all—my first reaction to your edits was, obviously, to hurl myself onto my fainting couch and mutter something unkind about your failure to recognize the infallible greatness of my prose. Once I got past that, though, I realized you were truly in my corner, like a cut man, seeing the strengths and weaknesses in my approach and helping me correct them so we could go out and win the fight together. (In this analogy, I’m not sure who we’re fighting. Torpor?) I’m also impressed as hell by the process of editing a book, since you have to keep so much in mind—from the granular, line-editing level to the galactic, does-it-all-hang together level. I imagine that’s tough, to say the least. Wagman: It’s actually a lot of fun. It’s such a different muscle than reading for pleasure or plowing through a stack of manuscripts. It’s refreshing to slow down and look at the nuts and bolts of the thing, or in your case: the interlocking box cutters. Sternbergh: There was a bit of whiplash for me (having never published a book) in going from your “Yes! We want it! LET’S DO THIS!” initial-acceptance stage to the “I have a few thoughts about changes … ” editing stage. It almost feels like those happen in reverse of their natural order. It helped, of course, once I realized that your editorial ideas were, you know, good. With a really good editor, there’s always the “You got me” factor—as in, the writer knows the editor is right, even if he doesn’t want to admit it, because the editor is singling out and questioning the elements that the writer was unsure about all along. That definitely happened with us. Wagman: Yes, there were some frank conversations about certain aspects of Spademan’s personality, but mostly I asked a lot of questions about Spademan’s world. I think (I hope) that helped clarify some of the plot mechanics for you. What’s been really fun for me, as we’ve been inching our way to publication (which, from when I first read the novel, will be 16 months. Book publishing: the medium of the future! ), is to talk about the book as a loving mishmash of genres. You’re playing with noir, detective, sci-fi world-building, speculative dystopia, and just out-and-out thriller. I publish a fair amount of thrillers, from spy novels to character-driven suspense to classic mysteries, and take great joy from reading those kinds of books—they’re fun, surprising, and offer plenty of opportunities for innovation and trickery. Sternbergh: I like to think of genre writing as being, in some ways, like chess: When you sit down at the board, many of the pieces you start with will be familiar, but it’s what you do with them after that first move that makes all the difference. I totally stole that chess analogy from Lev Grossman, by the way. Wagman: Will you ever write another, different kind of book? Sternbergh: That feels like kind of a trick question, because in some ways Shovel Ready was born from the ashes of trying to write another kind of book. That other book was entirely lifeless, for a million reasons, the first of which being that I was writing it to write it, rather than to read it—which is to say it was born from some other less noble instinct than providing maximum pleasure to a reader (recognizing that readerly pleasures come in many, many forms). Which sent me into a creative tailspin. Which sent me into a long period of redevouring many of the books and movies and other cultural morsels I’d most enjoyed in my life. Which reminded me how much I like things like dystopias and speculative scenarios and noir and twisty plots and scenes in which someone says something really cool or creepy or funny right before they kill a bad guy. Those are fun! Why resist them? Wagman: Exactly! The more you embrace them, the better your book will be. The joy a writer takes in their own work is palpable and, in turn, becomes evident to the reader. I always think of Michael Chabon’s The Yiddish Policemen’s Union in that regard. He had a blast writing that book, and it showed. Sternbergh: That book was huge for me. As to writing another kind of book in the future—sure, I’d love to try it, and I hope I could do it, but I will say, there’s something so thrilling and liberating in embracing all the different possibilities of genre writing, that I do think it would be hard to rein all that back in. It’s just too fun. Incidentally, I almost resisted using the word “genre” there, because I feel like genre implies something about a book’s content (e.g., crime novels have crimes in them, science fiction has science, etc.). I’m starting to prefer the word “pulp” instead, because to me that implies a sensibility. And I think I’m addicted to pulp. Wagman: I like that! And the great thing about pulp is that it can be tinkered with and modified to many different forms, allowing for vastly different books all with a similar backbone and still offer, as you say, unique readerly pleasures. Sternbergh: You’ve brought a lot of literary genre … er, pulpy … books to Crown, and I know you read a ton, both personally and professionally. And I also know there are books that make you sit up straighter in your chair from Page 1, and books that make you roll your eyes and chuck the manuscript just a few pages in. My question: What exactly, for you, distinguishes the really successful books from the others? I’m assuming, for example, that Shovel Ready was not the very first dystopian novel with a hardboiled hero with a damaged past to cross your desk. Wagman: Oh yes. I get tons of futuristic-dystopian-virtual-reality-hit-man-noir. Sternbergh: So what really jumps out at you, in general? Are you looking for voice? Language? New twistier plot twists? WHAT’S THE SECRET FORMULA, WAGMAN? Wagman: Writing definitely comes first—if you’re a strong writer, you can sell almost anything, plotwise. But style has a lot to do with it. Same with bravery—I find myself getting swept up by a fearlessness and clarity of vision. A lot of times that comes with some genre-bending. Basically, there are so many books being published these days, so I look for anything that will make it stand out from the glut. That must be true for you in magazines, yes? I find that I go back again and again to a phrase from a George Saunders essay about the short story “The School” by Donald Barthelme, in which Saunders says “the real work of the story [is] to give the reader a series of pleasure-bursts.” Pleasure-bursts! How great and how rare those are. And that’s all I’m really asking for, as a writer, an editor, or a reader. Pleasure-bursts. You know them when you feel them. Shovel Ready by Adam Sternbergh. Crown.